Apartment Marina 2. Newly built (2010). Excellent and exclusive views of the Prado de Conil and the Atlantic Ocean, Playa del Palmar. For 2 or 4 people. In building new modern 12 houses with gardens and private pool. Finished in high quality. Tumbled marble throughout the house, terrace and tiling in bathroom, electric blinds, PVC carpentry 6 +12 +6. Fully equipped kitchen, bedroom and bathroom. Flat TV Freeview, Satellite, WiFi 10Mb, AC in living room and bedroom, solar energy independent. In quiet area near the beach and town. Very well connected around the Shire. From the terrace you can see the meadow of Conil and Castilnovo beach with its watchtower. Castilnovo Tower, was built in the sixteenth century by the sixth Duke of Medina Sidonia, aagainst a possible attack Muslim-Berber. You can also see the Trafalgar Light House, which reminds us of the famous battle in which Admiral Nelson defeated a French-Spanish fleet in the called Largest Naval Battle of history, in 1805. From Conil can access almost all of the region known beaches of 'La Janda', our complex is in the center of the region. To the North of Conil, the beaches of 'La Barrosa' and 'Roche', Conil Coves ('Cala del Aceite', 'Cala Encendida', etc..) Going through the well known 'Playas de la Fontanilla', 'Playa de los Bateles' or 'Playa de Conil', where many sports are practiced in the River Salado (just in from of our complex). Castilnovo beach is a Virgin Beach along the 'Salado' River, in an area called Prado de Conil. The Prado de Conil has an special environmental protection where cattle 'retinto' graze and it is cultivate the 'Sunflower'. Bird watching or hunting with Greyhounds are activities taking place in the winter in Conil Meadow. Also here you can visit the mill and wine cellar, ecological place, called Villa Sancha Pérez (1Km). The Beaches: Playa del Palmar, where sports of Surfing, Kite, and others, very pleasant to see the sunset with its bars of Chill-Out in 2 km from coast. 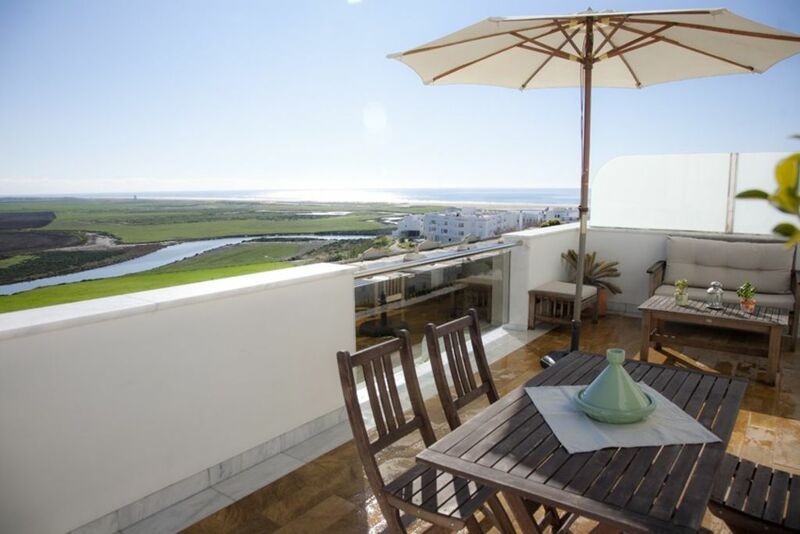 Excellent and exclusive views of the Prado de Conil and the Atlantic Ocean, Playa del Palmar. For 2 or 3 people. In building new modern 12 houses with gardens and private pool. Finished in very high quality. Marble throughout the house, terrace and tiling in bathrooms, electric blinds, PVC carpentry 6 +12 +6. Fully equipped kitchen, bedroom and bathroom. Flat TV, Satellite, WiFi 10Mb, AC in living room and bedroom, solar energy independent. Chance Garage. In quiet area near the town beach and the apartment you will like very much for your excellent views. All our tenant are very quiet and polite people. We try to make the complex a relaxed and comfortable vacation spot for all our customers. No smoking, no pets allowed. Die Ferienwohnung liegt in ruhiger, aber trotzdem zentraler Lage am Rande von Conil. Sowohl die Stadt,als auch der Strand sind bequem zu Fuß erreichbar. Wir sind trotz später Ankunft sehr freundlich von Pablo empfangen worden, der uns ausführlich alles erklärt hat und während unseres Aufenthaltes für uns erreichbar war. Die Wohnung ist sehr sauber,hell und freundlich eingerichtet, mit allem Notwendigen ausgestattet und hat eine sehr große Terrasse mit wunderschönem Ausblick auf den Fluss und das Meer.Wir haben uns sehr wohl gefühlt ,unsere Zeit genossen und kommen gerne wieder. Wunderbare Ferien Wohnung für einen entspannten Urlaub! Die Ferienwohnung verfügt über alles: Küche mit Geschirrspüler, ausreichenden Kochgeschirr, Porzellan und Gläsern, moderne und ansprechende Möblierung, phantastische Dachterrasse mit essplatz und gemütlichen sesseln und grossem Sonnenschirm. Pablo war als Vermieter sofort vor Ort erreichbar und hat uns alles wichtige zur Wohnung erklärt. Die Wohnung war bei Übergabe blitzsauber!. Die Kaution wurde nach Beendigung des Urlaubs sofort zurück überwiesen. Wir werden die Wohnung beim nächsten Urlaub wieder anmieten! Idéalement placé, l'appartement est à 15 minutes d'une très grande plage de sable fin qui ravira les amateurs de ballades au bord de l'eau. L'appartement est très propre et possède une vaste terrasse avec une très belle vue sur la côte. Enfin, le très bon accueil de Pablo, le propriétaire est à souligner. El apartamento es perfecto ; la terraza tiene unas vistas inmejorables , el apartamento perfectamente equipado , limpio y todo como nuevo. Hemos pasado unos días muy agradables ! El precio es para 2 Adultos. Juego extra de Toallas y sábanas: 15,00€. Cuna y Trona bajo petición: 20,00€/semana. Limpieza extra: 15,00€/h. Descuentos para estancias de larga duración. El precio Incluye: - Juego de sabanas por cama y semana. - Juego de toallas por persona. - Luz, agua e impuestos. - WIFI y aire acondicionado. - IVA e impuestos. Reserva: 20%. Fianza: 200€ La fianza garantiza el buen uso y utilización de los enseres e instalaciones de la vivienda. Tanto el continente como el contenido se encuentran asegurados con compañías aseguradoras. Condiciones de nuestro alojamiento: www.miradordelprado.es INFORMACION ADICIONAL Después de confirmar su reserva, usted recibirá toda la información relevante (confirmación, dirección y plano de ubicación), la información general sobre los apartamentos y las condiciones de alojamiento, se encuentra en nuestra web www.miradordelprado.es.